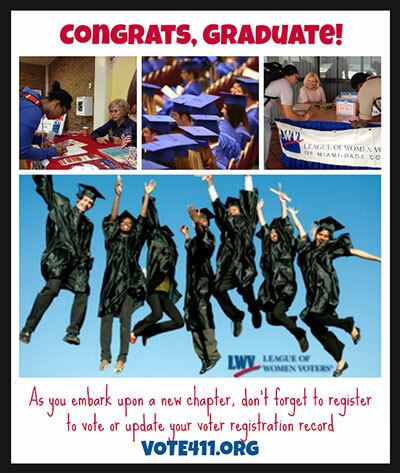 Share this eCard with the graduates you know and congratulate them on their achievement, and remind them to register to vote. Please do not use 'Dear Friend' in your message, since that clause is known to trigger spam traps on many email servers. Congratulations on your recent graduation! As you embark on new adventures, take a minute to register to vote or update your voter registration if you’ve moved since the last election. Voting brings us together as Americans – it is the one time when we are all equal. It doesn’t matter if you’re rich or poor, or young or old; elections are your opportunity to elect leaders who lift up our communities and make our future better. Registering is as easy as it is important – just click on the image below, fill out the printable form and send it to the address listed. Congratulations again! We recommend that you do not use the term 'Dear Friend' in your email since many email servers are configured to view content like that as spam. Use something other than that to ensure that your friends recieve your postcard.